Most haggard old pros gave their souls up to Nikon and Canon long ago. 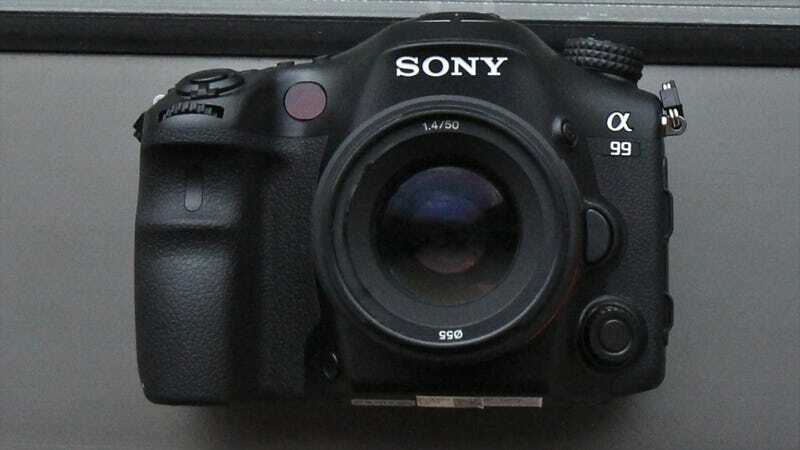 Too bad for them because the Sony a99 is the kind of DSLR the pros of the future might be looking for: Small, fast, and furious. Like the a99's natural competitors the Canon 5D Mark III and the Nikon D800, it's got a full-frame sensor. In the a99's case it's a 24-megapixel 35.8 x 23.9mm sensor, so it's slightly higher resolution than the Canon but still leagues lower-res than the 36-megapixel D800. So what makes this camera so special? You'll notice the difference as soon as you pick it up. At just 25.9-ounces it's a nearly a half-pound lighter than both the D800 and the 33.5-ounce 5DMKIII. It's also smaller than both of the other cameras. If you've ever lugged a camera around all day, you know that makes a difference. That said, the build definitely doesn't feel as sturdy as the Canon and Nikon cameras. The camera also sports a sparkly new autofocus technology that uses not one, but two phase-detection sensors for increased speed and accuracy when trying to lock on to a subject. Will that make a difference? We'll have to wait to try it out—especially since the 5D's new AF-system is so fantastic. As for video, the a99 appears to be stacked. Unlike its competitors, it shoots 1920 x 1080 at up to 60 frames-per-second. It's also the first pro-DSLR to use continuous autofocus while shooting video (the Canon T4i also has continuous autofocus while shooting video, but it doesn't work very well).